This li'l angel is heaven-sent! This heavenly 3 piece set features a tutu skirt wings and headband. The pink tutu skirt features three tiers of soft tricot and sparkle tulle. 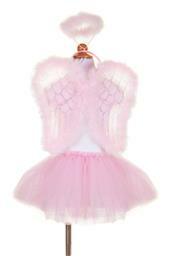 Marabou trimmed angel wings are size flexible with elastic covered satin straps and features glitter printed details. The marabou covered halo headband finishes the outfit!